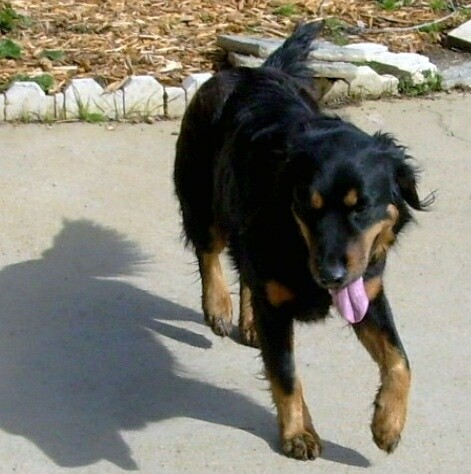 The English Shepherd is energetic, intelligent, very active, agile, courageous and gritty. Fearless for its purpose. Acting immediately when commanded; very responsive to the master's voice. Adapting themselves almost at once to working commands around farm stock. Working characteristics include: strictly low heeling; and very free with the use of their teeth. Also very watchful as guards of the home. Companionable to their master. Primarily a stock dog, the English Shepherd has also traditionally been used for hunting and as a watchdog in addition to being the family pet. Recently there has been a growing interest in the English Shepherd as an athlete for competitive events such as agility, Flyball and Frisbee. Some individuals may excel in all of these activities, but most will have strengths and weaknesses for one or another purpose. Wonderful with children and not generally dog aggressive with other dogs, they are good with other pets if raised with them from puppyhood. Generally friendly dogs, however they can be reserved with strangers. They make wonderful watchdogs, alerting the owner of approaching strangers. 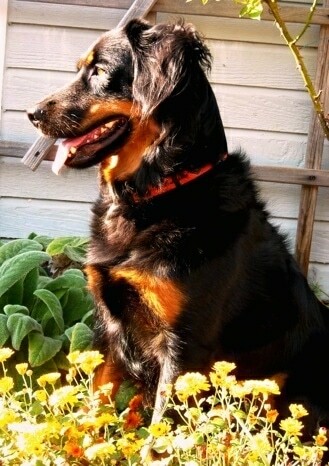 The English Shepherd needs a firm, but calm, confident, consistent pack leader in order to be mentally stable. 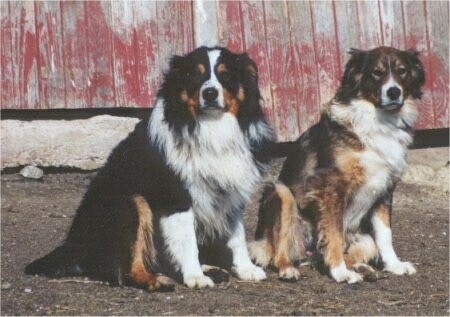 Hip and elbow dysplasia have been found in the English Shepherd breed as well as almost every other breed. For this reason, it is in your best interest to choose a puppy from parents that have been evaluated at 2 years of age or older and certified by OFA or GDC to be free of hip dysplasia and elbow dysplasia. Some herding dogs carry a MDR1 gene which makes them sensitive to certain drugs that are otherwise okay to give another dog, but if tested positive for this gene can kill them. This breed needs to be taken on daily walks or jogs. According to legend, the English Shepherd is almost pure Roman sheep and cattle dog, originally brought to the British Isles by Caesar when he invaded in 55 BC. He used these dogs to herd the livestock brought along to feed his troops. As the livestock were depleted, surplus dogs were left along the way, and were used by local natives and interbred with existing types of dogs with similar "herding" talents, to intensify those instincts. The English Shepherd was brought to the American colonies by some of the first settlers and followed the development of the United States from east to west. This multi-purpose breed was highly prized as it was used to herd valuable livestock and to protect the isolated homesteads. 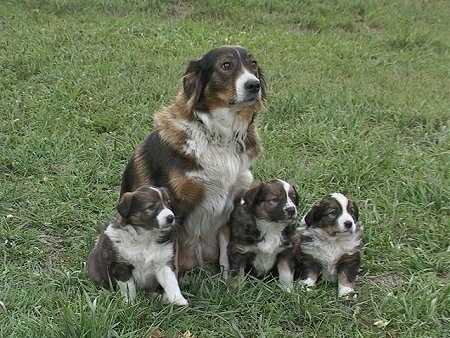 The United Kennel Club is the original registrar of the English Shepherd and has recognized it since 1934. 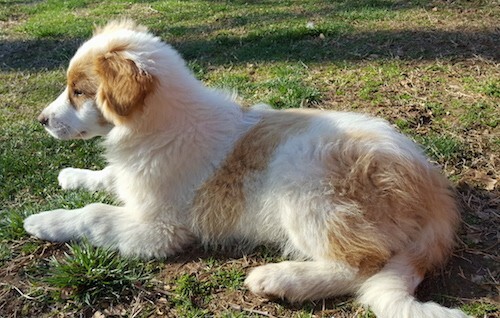 "This is Bandit, a 4-month-old English Shepherd puppy. We live in the city, but have backyard chickens, which a hawk had killed one of, so we got Bandit to take care of them. Along with that, he runs off the squirrels from our garden, so he stays pretty busy."